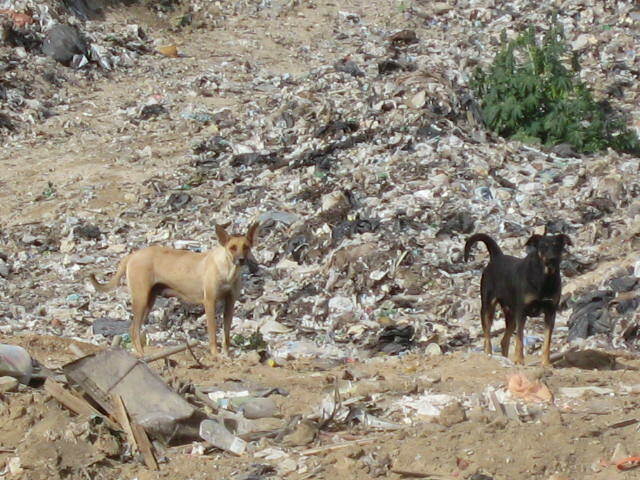 A couple of the healthier dogs living at the dump. Half-way between the coast where I live and the city where we shop sits the municipal dump. El Basurero Municipal. Before the miracle of garbage collection came to Vinorama, we used to take our garbage directly there on our way to town. But we had to stop. The trip to the dump had become too much for us. I’d often leave the dump in tears. As we approached the dump, windows were rolled up, air conditioning turned on. Flies, moscas, increased in number the closer we got. Entering, we made our way to the area for domestic refuse. Here the flies buzzed in huge clouds everywhere, seemingly flinging their little black bodies at the car windows in a frenzy. Despite Tony admonishing, “Don’t look, just look straight ahead, don’t look around!” I could not help myself. On this occasion there were several people climbing about, over, and through the mounds of garbage. Right in front of where we parked our vehicle, a chubby man sat in a large pile of garbage. I watched in horror as he opened a bottle of yogurt drink, sniffed the contents, and, cocking his head, gulped it down. The scavengers were naturally filthy, but what was unsettling was that they appeared to be asleep, moving about like the walking dead. Hunger aside, I wondered what possessed them? Dumbfounded by what I’d witnessed, I got out of the truck and put myself to the task at hand. While Tony unloaded the garbage, I opened several cans of dog food and poured them onto paper plates. Together we walked to where a large group of dogs waited and laid the plates on the ground. The dogs did not run over, despite the fact that their noses detected something other than rotting garbage on the plates. And if we moved too fast, they retreated in abject fear. I focused on a brindle-coated puppy of about seven months, old enough to already be fearful, but still more trusting than the older, wizened hounds. Satisfied that we’d done what we could, our supply of dog food almost exhausted, we departed the tragic scene. We could only take so much. But this time, just outside the gates of the dump, we were assaulted by another sight. A large honey-colored dog trotted down the road towards the dump. She held her head low, a furrow on her brow and, in tow, were eight puppies. They were carbon copies of their mother, the only variation being a small white patch here or there on a foot or chest. They couldn’t have been more than seven weeks old and were skinny, so skinny. Their mother was skin and bone too. Her teats hung flaccid and empty. Stopping the truck, we jumped into action. “Get the food open! Get the food open!” Tony urged, “so they smell it before they run away!” The mother had already retreated into the dust-laden bushes, a look of horror on her face. Several puppies followed her, scrambling over mounds of dusty garbage that hadn’t quite made it to the dump. A few of the braver pups were looking at us curiously, their noses moving, heads perked and ears turning this way and that, conscious that mom was telling them it was not safe. They detected something…something that smelled too good to ignore. A bowl with clean, fresh water and a plate of canned dog food were placed as close as possible, but well off the road. Encouraging noises were made. Thankfully no trucks had come and we worked as quickly as possible, while trying not to frighten the wary dogs. One pup made contact with the food and dug in, energized by the realization of what heaven was. Her litter mates, sparked by her reaction, came running. Pushing, jostling for position, they gulped the food down in great bites, barely pausing for breath. A second plate was prepared and the puppies encouraged to eat their fill. Mama dog watched, clearly still very frightened, but her pups were now oblivious to her fear. A truck was coming, we had to move. Reluctantly we departed, leaving them there, on the side of the road, mother watching, not eating, staying a safe distance away. We pulled away slowly and the tears welled up. Through them, I expressed my dismay. Tony was angry and upset too. Frustration came from understanding what could and couldn’t be done, from knowing that the mother would not be easily caught, that the pups would run away too. Homes for puppies were getting scarce and fewer still were willing to take a feral dog like the mother. And we already had eight dogs. This situation had played itself out far too many times over the course of our stay in Mexico. More and more organizations crop up with the goal of making a difference in the lives of animals here, but at the cultural level the issue of animal overpopulation and mistreatment gets little attention. Among Mexicans, there is great resistance to animal sterilization based on traditional religious and cultural beliefs. And it is not purely the uneducated and simple who resist. Even some well-educated and wealthy Mexicans revile the act. I’m thankful that we no longer have to go to the dump, but the images of the frightened mother and countless other abandoned animals are imprinted indelibly upon my memory. It is in images such as these that paradise is lost. Love is an open sky. This idea is ugly because it is untrue. This idea is illusory, but our society exists, is based on this idea that each person is a person, not a presence. The truth is that there is no person at all in the world; there is only presence. You are not — not as an ego, separate from the whole. You are part of the whole. The whole penetrates you, the whole breathes in you, pulsates in you, the whole is your life. Love gives you the first experience of being in tune with something that is not your ego. Love gives you the first lesson that you can fall into harmony with someone who has never been part of your ego. If you can be in harmony with a woman, if you can be in harmony with a friend, with a man, if you can be in harmony with your child or with your mother, why can’t you be in harmony with all human beings? And if to be in harmony with a single person gives such joy, what will be the outcome if you are in harmony with all human beings? And if you can be in harmony with all human beings, why can’t you be in harmony with animals and birds and trees? Then one step leads to another. A miracle has occured here in Las Vinoramas on the East Cape of Baja California Sur, Mexico. It is a simple thing, nothing that you will see on the 6 o’clock news, but a miracle none-the-less. A couple of weeks ago an email was received from a neighbor living to the South of here in Playa Tortuga (a lovely name meaning turtle beach). This email announced that a service was being offered to pick up garbage and recyclable materials. I read the email with detachment, not wanting to get too excited about the situation, as this did not necessarily mean that they would be providing this service all the way out to Las Vinoramas, the middle-of-nowhere really. An email was sent to the persons indicated and a very pleasant response was received from a lady named Brenda Navarro. The response, in English, included an agreement to come and tell me about their services so I could share the information with anyone in the neighborhood who was interested. I immediately sent out an email sharing the address of Brenda to everyone in the neighborhood. That night I mentioned this incredible phenomenon to my neighbor who owns the local restaurant and learned that a second miracle had taken place. In response to my neighbor’s email, they had come and picked up her large pile of garbage that very day!! This was a good sign. Maybe this time it was really going to happen. Clearly it had begun. Now a bit of explanation is required here for those of you unfamiliar with life on the extreme boundaries of Mexico. The reader needs to understand that many promises are made in this country and many are broken. Many rumors start about roads getting paved and municipal water systems being installed, power being delivered, police presence being more regular, and yes, more than once, regular garbage pick up being conducted. Typically, if they begin at all they soon falter. So from this history of initiatives lost, you can better understand my stance of not getting too caught up in the prospect of having our garbage picked up. But there it was, Joan’s garbage had been retrieved. I was feeling optimistic. And yet another miracle occurred a few days later, when the lovely couple, Brenda and Moises arrived at my house at the stated time for our meeting to discuss garbage and recycling. They explained that garbage pick up was to occur twice weekly and would cost 200 pesos ($14) per month. For an additional 150 pesos ($11) a month they would retrieve recyclables including paper, plastic, tin cans, aluminum cans, glass and batteries! Hallelujah!! Until now, the author has been saving up discharged batteries and has been meaning to take them to the United States on one of her frequent trips there so they could be recycled. Of course, when it comes time to fly I always forget to pack them, remembering them only upon returning. In addition, the guilt felt each time a plastic bottle or glass jar is thrown in the waste basket has been creating deep lines on my forehead and small pock marks on my spirit. When the printer acts up producing multiple copies of something of which only one is required, again the guilt is felt, true regret at our use of resources with no way to recycle. The option then is to exercise the other of the three “R”s and reuse the paper…but I have a rather huge stack collected now. Upon retreiving the recycling, the Navarros took with them as well a large cloud of guilt that has loomed above the author’s head since moving into her home on the beach. A true miracle in paradise. It turns out that the author was exhausted, not from the trip to town, but by a nasty virus or bacterium that has taken up residence in her temple. The head is full of snot and so the thinking process is somewhat undermined. In fact, the head is so full of liquid that the nose has become like a leaky faucet. Quite unpleasant. This is another of the hazards of the trip to town. One is exposed to many bacteria coated surfaces and if one does not take the necessary precautions, illness is almost assured. Before moving to this country, the author did not get sick very often. Now she seems to be getting cold after cold. And now I am faced with a dilemma: the author had hoped to attend the birthday party of a friend and fellow surfer under the very big and beautiful Fig Tree that is reported to be many hundreds of years old. This Mexican friend’s lovely wife is also a nice woman of similar age to yours truly, whom I had hoped to pass some festive time with. What to do? A nap is in order. To warm the chilled toes and rest the sore body. And hopefully gain strength enough to attend la fiesta. A little tequila will surely kill whatever it is that ails me. In my bleary state of compromised health I have opted to share a communication received all the way from Ireland today. The following has been adapted and corrected for errors (for example, the email has sexed the dog incorrectly – it is a “she” not a “he”). I feel compelled to share it because there is so much beauty in this story. Faith was born on Christmas Eve in the year 2002, with 3 legs. She had 2 healthy hind legs and 1 abnormal front leg that had to be amputated. She of course could not walk when she was born. Even her mother did not want her and the puppy was rescued when she tried to smother her. Jude Stringfellow adopted her and ignored veterinarians’ advice to euthanize the puppy. Jude was determined to teach and train this dog to walk by herself. So she named her ‘Faith’. At first, she put Faith on a surfboard to let her feel the movement. Later she used peanut butter on a spoon as a lure and reward for her to stand up and jump around. The other dog at home helped to encourage her to walk. Amazingly, after only 6 months, like a miracle, Faith learned to balance on her 2 hind legs and jumped to move forward. After further training in the snow, she now can walk like a human being. Faith loves to walk around now. No matter where she goes, she attracts all the people around her. She is now becoming famous on the international scene. She has appeared on various newspapers and TV shows. There is even a book entitled ‘With a Little Faith’ that has been published about her. Her owner Jude Stringfellew has given up her teaching post and plans to take her around the world to teach others that even without a perfect body, one can have a perfect soul. In life there are always undesirable things. I hope this message will bring hope and fresh new ways of thinking to everyone and help us to appreciate and be thankful for all the many small blessings in our lives. I returned safely from my journey to town with only a tongue burnt from free, but very hot coffee offered up to the shopper at CostCo. They even had biscotti to go with the coffee! How incredible…like a little café right there in the store. Of course I was and am still exhausted from the trip to town. By the time everything, including 5 very large bottles of water and two five gallon buckets of paint, was unloaded and put away it was almost 8pm. And the only thing eaten all day was the aforementioned mini coffee, piece of biscotti, one granola bar, some potato chips, a banana and a donut. Yes, a donut. There was no time for the very wonderful Miss Cynthia’s organic veggie lunch. I don’t know what possessed me to buy the donut. I don’t as a rule even like donuts. But maybe not having a proper lunch really weakened me. All I know is that I think I can still feel it in my stomach some 19 hours later. And my whole body aches. Is it the donut? It is not the road, which by some miracle was very recently graded after months and months of no maintenance whatsoever. Smooth sailing it was, all the way there. Probably the donut. And the biscotti. And the coffee. All of which the author seldom allows to enter her body, her temple. The potato chips? No. My body is very accustomed to those. I bought myself another treat yesterday that was not junk. The temple of CostCo was selling beautiful little trays of raspberries. Bright red, with hues of pink, juicy, and delicious-looking. Raspberries are something very near and dear to the heart and palate of the author. There is an emotional, historical attachment to raspberries that arises out of time spent at the family’s summer cottage on a lake in the Laurentian Mountains of Québec, Canada. When I was a child and raspberries were in season, my mother would pack a group of us kids and usually one of her friends in the car and we’d drive out into the wilds of Québec looking for clearings in the forest where raspberries were sure to be found. Singing to scare away any black bears that might be feasting on the very fruits we sought, our buckets in hand, we would disperse into the thicket of raspberry canes that were often so high you couldn’t see someone only a few feet away. 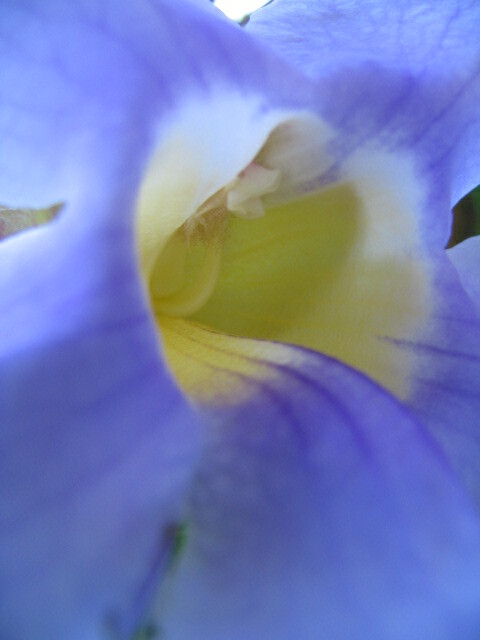 The sun was hot, the air dry and the cicadas buzzed, adding intensity to the heat. In our shorts and tank tops or bathing suits, we were scratched and tugged at by the thorny raspberry canes. We filled our buckets and our stomachs. There was nothing so delicious as those berries going directly into the mouth from the cane. We left the thickets hot, sweaty, disheveled with bright pink tongues lolling from our mouths. And excited, knowing what was to come. Back at the cottage, we would have berries after dinner, with milk poured on top and just a bit of sugar. They melted on the tongue, the juices dripped down the throat, creating a sensation that was as close to heaven as I could imagine. The eyes closed in ecstasy. My mother would make pies, wonderful raspberry pies that were eaten with almost as much pleasure as the berries and milk. Homemade raspberry pie is still my favorite, but of course, only made the way my mother does and preferably made by hers truly. The trees have grown up around those berry laden clearings now and the dense bush has become a forest full of maturing maple, birch and some oak. A testament to the passage of time and the resilience of mother nature. But I still like my raspberries with milk and a bit of sugar. Today the rather arduous trip to town must be made to buy food, drinking water and gasoline for my truck, to have laundry done, drop off a surfboard for repairs and, if I am lucky, my friend Sunday can squeeze me in for a massage and chiropractic adjustments. The trip is arduous because it takes 2.5 to 3 hours to get to the temple of CostCo, where soy milk, pine nuts, walnuts, good wine and cheese can be purchased. It is arduous as well because the first half of the trip is over a very rough, pot-holed, windy and washboard-riddled road. If I am lucky, the grader will have passed over it recently, but in light of recent months’ performance, this seems very unlikely. Since the new delegado (mayor) took his seat, the roads to the East Cape have been woefully neglected. If I did not need to go to CostCo, I could get all my groceries in San Jose, but the savings and selection at CostCo really are unbeatable. I also need to buy paint this trip, so I will go all the way into Cabo San Lucas to my friend Dionicio’s paint store and get his assistance with matching some colors. All in all it bodes to be a very full day. If I time it just right, I’ll have lunch at Cynthia’s, a lovely restaurant with vegetarian selections made from organic vegetables in a beautiful courtyard. The trip to town is approached with some trepidation. There is always the chance of a flat tire. Before moving here I had not had one single flat tire in my entire life. Since arriving it has become a serious concern and driving is done with this in mind. There is also the chance of a break down for other reasons – this is particularly unsettling because should this happen I will be alone and stuck on the road and in need of assistance where there is no cell phone service. At one time I would have had to wait very long to see someone on the Palo Escopeta Road, but these days there is a rather constant flow of traffic. Then there is the concern once arriving in town of an accident. It is unfortunate that the drivers in this part of the world are terribly inadequate and drive like they are trying to get a dying man to the doctor or a priest. This may have something to do with the fact that in order to get a driver’s license here all you have to do is answer a series of questions about which governmental department is responsible for which aspects of road maintenance and safety and presto! you’ve got your license (after paying the applicable fee and having your blood type determined). I was quite amazed when I realized that there was not one question on the exam about how to drive. And then an internal light flipped on and I understood the cause of the resulting roadway insanity. Of course, to get into an accident here as a foreigner, you are almost guaranteed to be found the guilty party and you better have your insurance in order. No matter if the other driver has none. No matter if they were driving 60 km/h over the speed limit and passing on the right! Magically, any witnesses to the event will have a change of perspective and side with the local person. Sad, but true. Each time that I return from town unscathed by accident or breakdown (vehicular and emotional), I breathe a sigh of relief and try to figure out how long I can hold out before I’ll have to return once again to the craziness that is town. Wish me luck or as they say here Que le vaya bien (may your trip go well). Felipe is our caretaker or, in Spanish, our velador. He is a simple man with very little formal education. He is not sure when his birthday is and he cannot read or write. When I came to live in Vinorama, Felipe was quiet and did not drink much. Tony had hired him to feed his dogs when he is away. Felipe was an excellent choice because, unlike many living in this area, he really cares for animals. In fact, animals are his best friends. Despite being relatively tall and very strong, he is painfully shy and speaks quietly, avoiding eye contact. It is clear to us that he has been treated very badly and has a very low opinion of himself. So, as is often the case with such individuals, he has a special bond with our dogs. Recently, when Felipe’s regular job ended with the departure of the local contractor from our lovely little community (made even lovelier by his departure), we decided we were ready to start a large project putting pavers around the house and on the driveway, which was just sand and dirt. A condition of hiring Antonio and Juan to do the project was that they also hire their former co-worker Felipe. When they hired Felipe, we told him that the first Monday he didn’t show up to work because he was still drunk, we would forever after hold on to his money and allow him to use it only for non-alcoholic purchases. The first payday came and went without incident, but it was only the second payday when he fell off the wagon with a thud and was drunk all day Monday and Tuesday. He would not get a second chance and we hold his salary for him from now on. Antonio told us that when he asked Felipe about the new arrangement that Felipe said he was pleased because he didn’t want to get drunk. Yesterday I got angry with Felipe for the first time. Getting angry at Felipe is a lot like kicking a dog, not something that I do as a rule. I’ve always been gentle with him and tried to show him that I cared about his well-being. I reasoned that in time he might come to learn that he was worthy of my caring and develop some self-esteem. This time though, I decided I had to be the “bad cop” for his own good. It was a Monday and he was working away on the property, making himself busy because Antonio and Juan had not returned from their weekend in the city. Mid-morning he stopped me as I drove off the property to ask me for some of his money. He said it was for two belts and a pair of pants that he would purchase from the traveling vendor. I counted out 500 pesos and told him if the items he needed were more expensive than that, that he should wait and I would arrange to get him some that were more economical. He agreed. I returned from my errand and at 2pm Antonio and Juan finally arrived. A couple of hours later, I noticed Antonio and Juan working away, but where was Felipe? Antonio told me he was watering plants at the neighbor’s house. I told Antonio that when Felipe said he was watering at Latini’s, he was actually at the local watering hole getting wasted. Antonio smirked knowingly. As chance would have it, I had to check in with a neighbor who coincidentally lives behind Mr. Latini’s house. As predicted, Felipe was not at Latini’s, so I decided to take action. On my way home, I turned in to the local restaurant/bar. As I pulled up on my ATV, it appeared to be completely empty, but as the bar came into sight, I saw that the sole patron was indeed our lost caretaker. Hearing the noise of my moto, he looked up, saw me and hung his head in shame. This was it. I was angry and I was going to let him know it. The whole time I was standing there yelling, I was only slightly aware that there were two restaurant employees standing behind me. When I turned and noticed them, the one I knew named Abraham began to make excuses and claimed no responsibility for Felipe’s state. “He arrived here drunk Senora. Those are the only two drinks he’s ordered here.” Greeting both employees politely, they seemed to relax and Abraham said “why don’t you take him home with you senora?” to which I replied “because I’m on an ATV and he will surely fall off before I get home.” They both nodded in appreciation of the obvious and Abraham said he would bring him home. I thanked him and turned back to Felipe to repeat my instructions that he was to eat and come home. I spent the rest of the evening at a friend’s house. I have no idea if Abraham did in fact bring Felipe home, but the lights in his casita told me he was there when I returned. I wondered if he had managed to get more booze and if he’d be in any shape to work the next day. And I marveled at how a man who once did not know what a lie was had learned how to weave a web of deception.